The rich and famous certainly live different lives to the rest of us, banking their millions, very little is off-limits to this select crowd. These days they don’t even need to leave home to spend vast sums of money with the most exclusive products just a mouse click away. One such website offers up Yachts, Submarines, an array of incredible Cars and even a bloody Pushbike that’s $50,000. 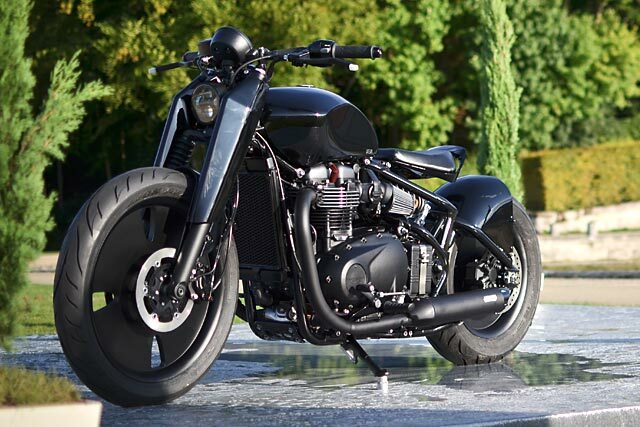 But scroll on over to the Motorcycle section and there is a limited run production motorcycle that won’t break the bank and doesn’t look at all out-of-place amongst the other toys for the 1%. From French design house VIBA comes a machine that combines elegant styling from the coach built era while being crafted using the latest technologies. 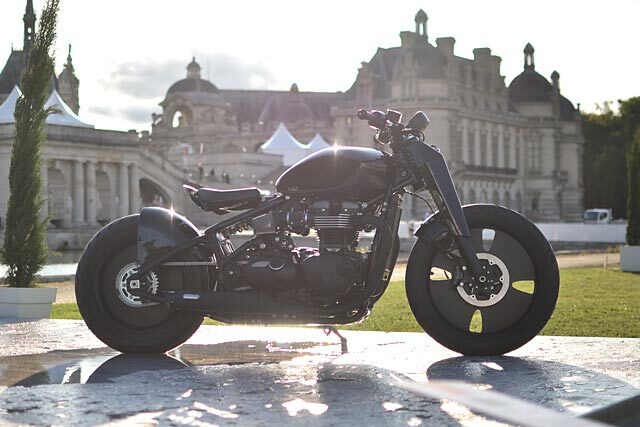 Based on the all new Triumph Bonneville Bobber she sits resplendent next to Bugatti’s and available only to a select few her name is Qora. 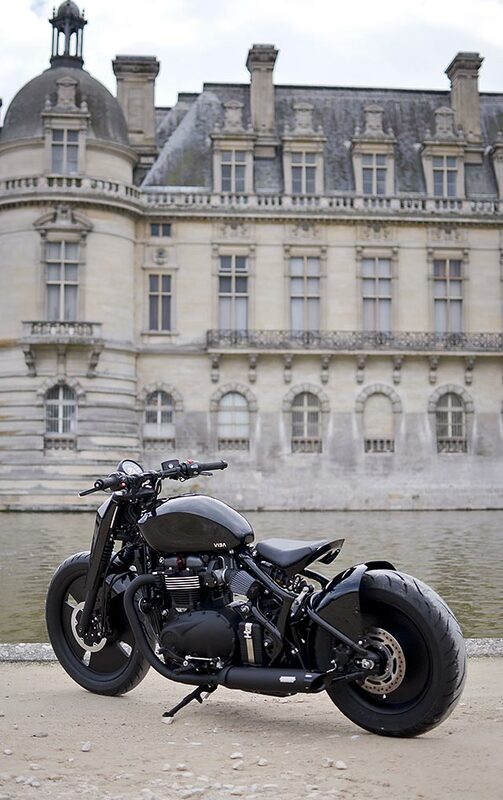 The brainchild of French designer Yann Bakonyi, VIBA is like no other motorcycle shop you’re likely to see, with more work done sat behind expensive computers than on grease covered benches. This is done for very precise reasons with the final renderings being constructed by high-tech milling machines, 3D printers and the latest in composite construction. 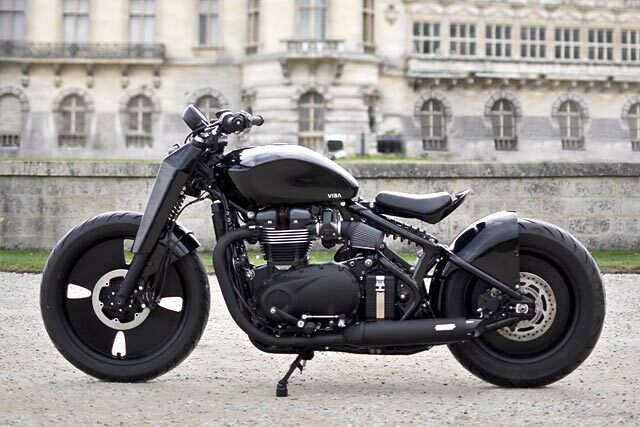 The result is not only a final design that looks exactly like the finished product but a level of fit and finish that is almost unparalleled in the motorcycle world. Regular readers of Pipeburn will remember VIBA’s original creation, the Lara 800 but Qora takes the game to a whole new level. To achieve these exacting standards Yann has ensured absolutely every part of the design and manufacturing process is done in-house under his watchful eye. “VIBA is using this combination of design and innovative technologies, to manufacture brand new certified machines in numbered editions. Thanks to this the brand is handling every step, from first ideas to final production parts internally, and taking advantage of the best craftsmen around,” explains the head honcho. 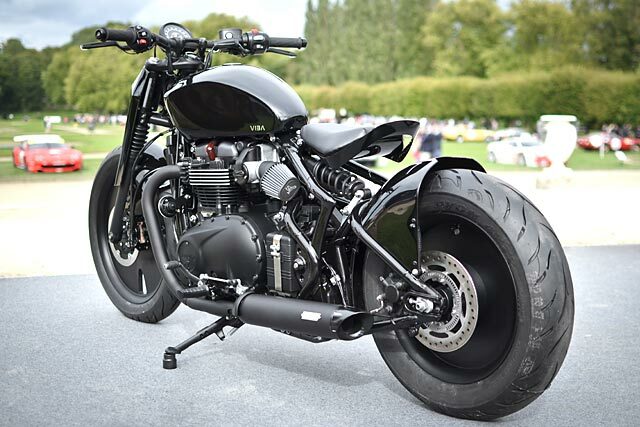 Having chosen the Bonneville Bobber as the platform for the build the first step was to strip the bike down as far as possible while retaining the necessary parts required for road registration. From here the blank canvas that remained could be scanned into the companies advanced computer system for the design process to begin. 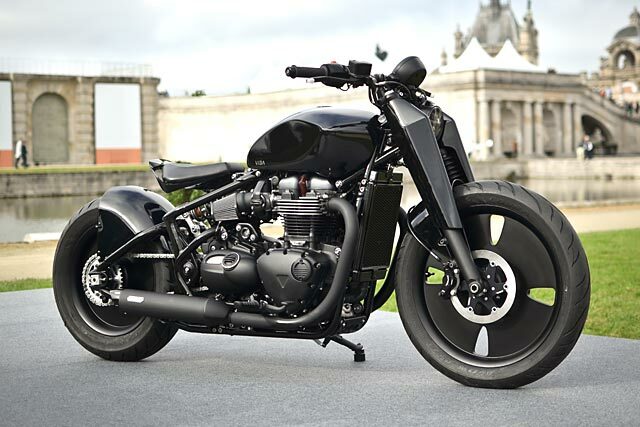 “Roger Tallon’s bike, the Derny Taon, was the main inspiration for this build. 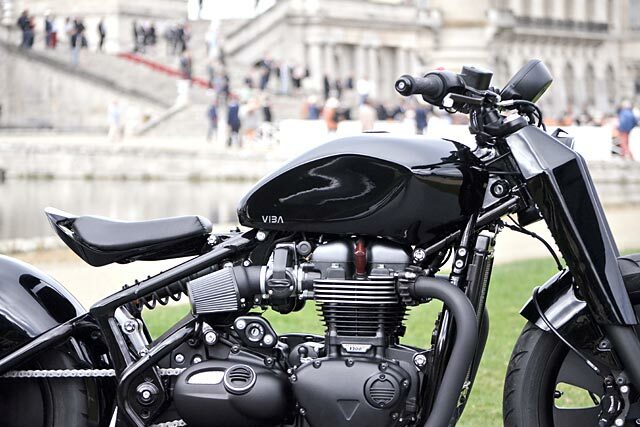 The crossing of motorcycle standards and product design gave a smart solution, which leads VIBA to design a bike at the border of innovation and high-end finish,” details Yann. While inspiration for the level of quality the team wanted to achieve came from the hand-built French exotics of yesteryear, those stunning supercars from Bugatti. With the design work complete the first component to be fabricated is the all new fuel tank that is crafted from aluminium. Each line is very deliberately laid down with the idea that the tank compliments and contains a representative element drawn from the other custom parts. A philosophy adopted from the automotive period when lead designers were the kings and the bean counters always ignored. Flowing rearward the seat and its minimalist surround picks up the theme and takes it further with a combination of heavy hand stitched leather and vented surround channelling air over the rear tyre. It requires a close eye to truly appreciate the detail and a look at the spec sheet only impresses further when you realise the seat support is a VIBA 3D printed single alloy piece. 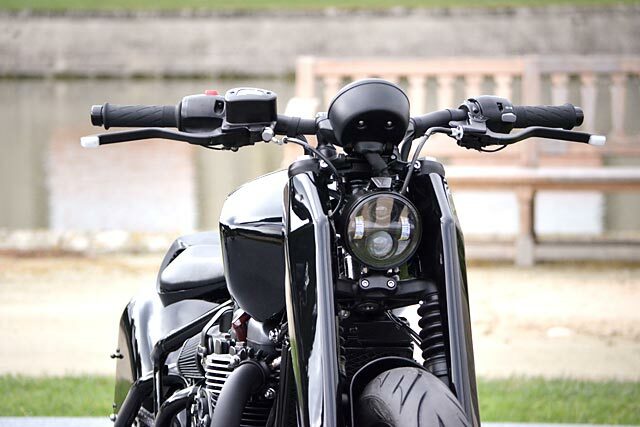 The rear fender is an item than Yann is particularly proud of, wanting to use a dramatic straight line to capture the eye and act more as an extension of the body work. The small recess in the very centre is only revealed when viewing the machine directly from behind giving more visual stimulus as you move around Qora trying to take her all in. 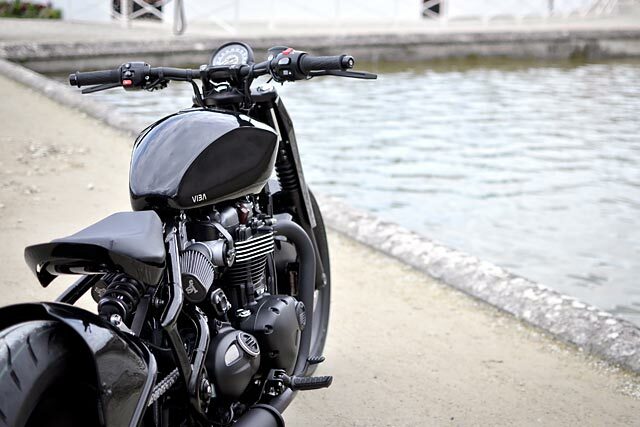 Up front the Triumph’s retro styling is totally transformed by the fork covers that give the telescopic items a hint of a girder look as previously seen on the Confederate Wraith without anything like the big American’s absurd price tag. The retention of the factory fork gaiters now almost completely hidden adds to the mystery of exactly what lies beneath. While the all new LED headlight is recessed as far back in between the triple clamps as possible and is housed in a 3D printed shell. While completing the body work is the “invisible” front fender only covering a small section of the back half of the tyre and once again making it unseen from various angles. Complementing the design the wheels create a statement all of their own, milled from a select alloy you won’t see any others like it. 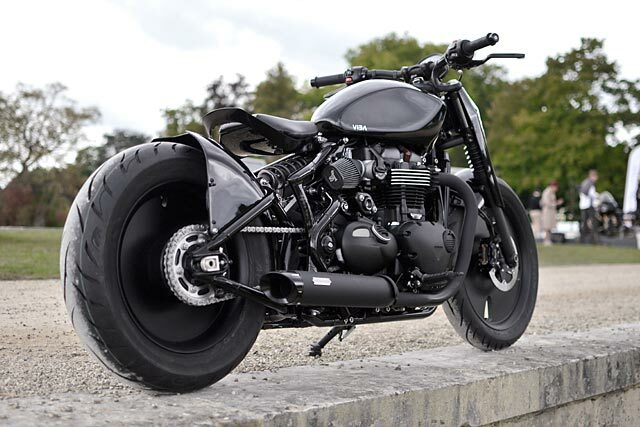 The rear is a solid unit to emphasise the wide rubber and bobber feel for an exaggerated sense of proportion. But it’s up front where the magic happens, the lenticular design creates an illusion of depth while the biconvex shapes scatter the light that passes through as the wheel rolls forward in motion. Interestingly enough on a motorcycle so filled with complex custom touches the tyres remain the factory Avon rubber for ease and cost efficiency of replacement. Although not a heavy focus of the build the engine doesn’t go untouched with Triumph’s all new 1200cc water-cooled twin getting some neat fettling. The vintage styling of the filter arrangement is swapped out for a very 21st century feel thanks to 3D printed adapters that support the strategically angled hydrofuge filters. The header pipes remain factory items but the new end cans add a much better sound track and their slash cut tips doth their cap to the lines of the nearby bodywork. While those lines are even less disturbed thanks to VIBA’s own levers that feature integrated turn signals. >These activate the one mechanical area to receive a major upgrade, coming in the form of the twin Beringer brake package designed just for Qora that should allay the concerns of those who felt the stock units were a little wanting under heavy use. Then with the bike extensively ridden and tested it was stripped down and readied for colour. Once again taking cues from the extravagant supercars of old, a single colour in this case piano black, is interchanged with raw metal for the cleanest and classiest of looks. So how does Yann and his team create such an incredible machine at what is to be a very reasonable price for a limited production run vehicle? 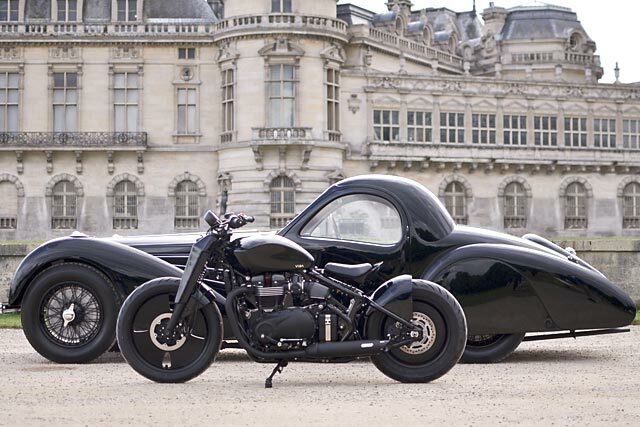 “By reducing the number of total parts, grouping elements when it’s possible, and reducing the weight or costs of parts, VIBA is thinking about everything from the ignition of projects and integrating everything in the design process.” Its genius, rolling art, and so it was fitting then that this absolute masterpiece was unveiled at Château de Chantilly next to a priceless Bugatti Type 57 SC Gangloff Atalante Coupe at the Chantilly Art and Elegance 2017. And like everything exclusive preorders for Qora are a must, now being taken at boutique auction house TheArsenale.com.